1 Heat oil in large skillet over medium heat and cook onion, stirring occasionally, 5 minutes. 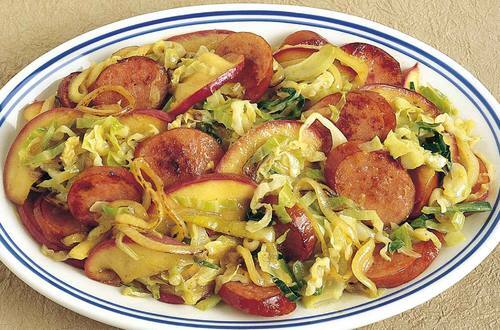 Add cabbage and apple. Cook, stirring occasionally, until tender, about 10 minutes . 2 Stir in apple juice, Hellmann's® or Best Foods® Dijonnaise™ Creamy Dijon Mustard, brown sugar and vinegar. Add kielbasa and simmer covered until heated through, about 5 minutes .